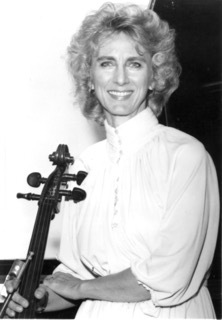 Cellist Joyce Geeting has performed many concerts in the U S and Europe as orchestral soloist and chamber musi- cian, often featured on radio or television. As soloist she performed Kodaly Solo Sonata and Villa Lobos Sonata for European Television. She has performed as soloist with the American Institute in Graz, Austria and in Rimbach, Germany, for the British Music Information Center in London, for festivals in Eisenstadt and Rome, and with the Collegium Quartet toured in Germany and Austria. She was the recipient of a National Endowment for the Arts Grant for chamber music touring. An advocate of new works, she recently performed with composer Dr. Hector Rasgado his new work, Body Notes, in Georgetown’s Everymay Mansion overlooking DC with performances also in Salzburg, Austria, Mexico City, Chicago and LA. Elegy After 9/11 by Composer Carol Worthey was commissioned by Geeting and performed in London, Germany, Los Angeles, and Chicago. As cellist she has served on the faculties of the University of Wisconsin at Oshkosh, Cornell College, University of Redlands, and California Lutheran University since 1997. In addition, she aids young cellists in their musical devel- opment. She has many award-winning students as well as former students who are professionals on three continents. Joyce holds a Doctorate of Musical Arts degre in cello performance and pedagogy from the University of Oregon. While working on her dissertation, she met Janos Starker and became a devotee of his playing and teaching, releasing her book, Janos Starker, King of Cellists in 2008. She is the 2014 recipient of the Outstanding Studio Teacher Award from The American String Teachers Association and the 2010 recipient of the Irwin Award for best biography as well as the Professional of the Year 2009 award from Cambridge Who’s Who. She was named “Artist of the Morning” in February of 2015 with her recording of Spanish Cello Music. She is the recipient of a National Endowment for the Arts Grant for chamber music touring. At Washington State University she was a teaching assistant and later taught at Rocky Mountain College, University of Wisconsin at Oshkosh, Cornell College, University of Redlands, and California Lutheran University. Recently she performed with the composer at the piano in Georgetown’s Evermay Mansion overlooking Washing- ton, D.C., and in Salzburg, Austria in the new concert hall of the Mozarteum. The work performed, Body Notes, is newly composed complete with video, by pianist Dr. Hector Rasgado Flores, physiologist and professor at the Rosalind Franklin University in Chicago. The work is a fascinating visual and aural description of human physiology and the life experience. This cello-piano duo has performed also in Chicago, in Los Angeles, and in Mexico City for that country’s bicentennial. Carol Worthey’s Elegy was premiered by cellist Joyce Geeting together with pianist Robert Sage at St. Martin in the Field in London for a standing room only audience. Elegy, a work for cello and piano or cello with orchestra, is a remembrance of the events of that fateful day in New York City and Washington, D.C. and a tribute to those lost in the attacks. The British were particularly supportive of Americans following the attacks of September 11th and gave the Geeting-Sage performance in London a lengthy standing ovation. Geeting and Sage also performed the work for the American Cello Congress in Arizona, as well as in California cities. They have been a performing duo for over two decades and recently performed Tchaikovsky’s Rococo Variations with his orchestra, Claremont Symphony. Together with pianist Christine DeKlotz, Geeting performed Elegy After 9/11 on the tenth anniversary of the terrorist attack in New York City.